UPTOWN — The flag outside Walt Disney Magnet School was at half-staff Wednesday afternoon as its principal prepared for the grave task of notifying students of the death of Diane Disney Miller — Walt Disney's oldest daughter, who contributed at least $700,000 to programs at the school. Principal Kathleen Hagstrom, minutes away from making the announcement on the school PA system, told DNAinfo Chicago she would encourage Disney's approximately 1,600 students to write letters of condolence and appreciation to Miller's surviving family. The Walt Disney Family Museum announced Tuesday that Miller died in Napa, Calif., "from injuries sustained in a fall." 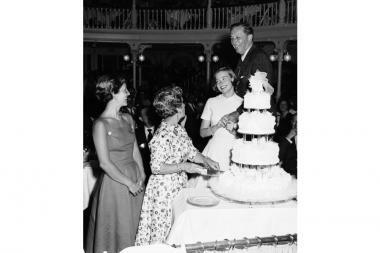 A young Diana Disney at a wedding anniversary celebration for her parents Walt and Lillian Disney in 1955. Hagstrom has been principal at Disney for 12 years and knew Miller for about 10 years. She remembers her as "this lovely, refined, elegant woman. Very soft spoken, very unpretentious, thoughtful and kind." "I am going to miss her terribly. I feel so fortunate that I had the opportunity to get to know her," she said. Hagstrom met Miller about 10 years ago at a small luncheon at the East Bank Club on the Near North Side attended by about eight people. Miller visited Disney at 4140 N. Marine Drive numerous times, most recently in May. On her first visit to the school shortly after meeting Hagstrom, the principal said students didn't know the philanthropist was coming. So, Miller was surprised when she walked past a classroom of students who were singing the "Mickey Mouse Show" theme song. Miller was very quiet as they toured the school, Hagstrom remembers. 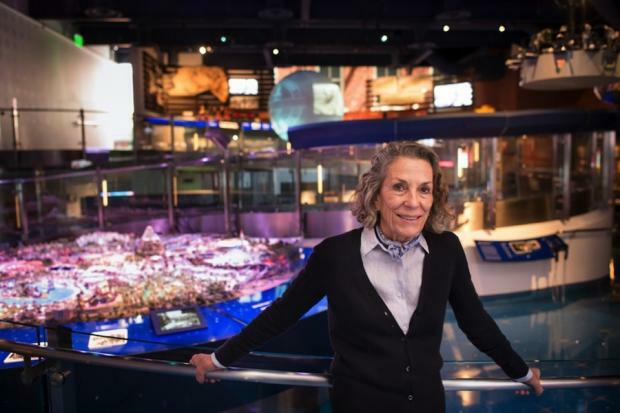 But she liked what she saw at the school, which opened in the 1970s as Chicago's first magnet school focused on integrating arts and technology into the curriculum. "She said: 'Kathy, my father would be very proud of what you are doing here,'" the principal remembers, her voice brimming with pride even years later. "I'll take that to my grave." Miller promised to contribute $50,000 every year for the next three years. The school put those funds toward building a $250,000 animation lab for students that opened in 2004. When she came back for the lab's ribbon-cutting ceremony, Hagstrom said the woman was so thrilled that she doubled her yearly contribution and gave an extra $100,000 that allowed for the opening of a digital media lab. By 2010, she had given the school at least $700,000. "She was very impressed and took ownership of what we did with this school, she wanted to support it and be a part of it," Hagstrom said. "Getting a grant is wonderful, no question about it, but it was really more than that." Miller's father Walt Disney, born in Hermosa on Chicago's Northwest Side, co-founded Disney productions, founded Disneyland and Walt Disney World, and is renowned across the world as an innovative animator and the man behind Mickey Mouse. Hagstrom, however, said of Disney's daughter: "Her style was so different from what you would anticipate," because despite all the opportunities and comforts her upbringing afforded her, she was humble and carried her father's legacy forward with passion and grace. She is survived by her husband, former Disney CEO Ron Miller, seven children and 13 grandchildren.